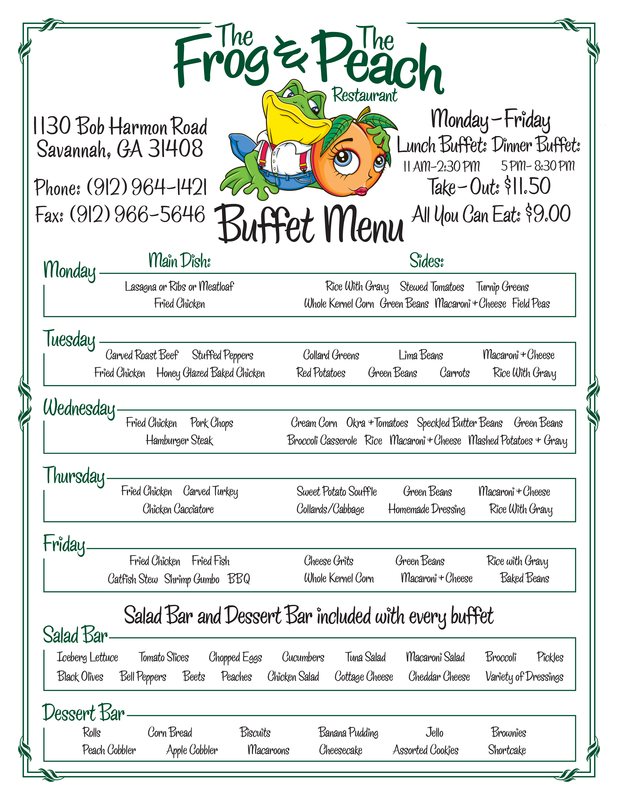 Buffet Menu | Down-home cooking made from scratch every weekday! 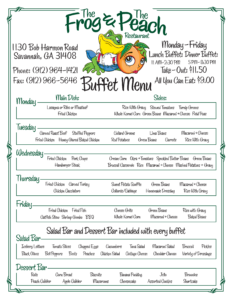 "...this authentic southern buffet that is ridiculously good. Don't mention the cheap price, only $9 a person with drink included. The fried chicken is juicy and perfectly fried, sides are all great. I would definitely recommend y'all come try this place..."
"This is a great home cooked southern eatery! Stopped to eat here based solely on reviews. Definitely not disappointed." "We are locals from Savannah and we visit here quite often. Food is always good and the service is awesome. Mr. Jefferson is our favorite. We always go when we know he's working." © 2015 The Frog and the Peach Southern Buffet. All Rights reserved.